I have one of these fitted and have set the pressure to approx 2.5 psi. The car runs well. Whilst fiddling today I fitted the gauge and watched whilst the engine was running. Most of the time the gauge hovered around the 2.5 mark but occasionally the reading fell to zero. Is this to be expected or am I about to see fuel pump failure? I have a gauge fitted to mine and the pressure never fluctuates. The pressure drop you experience has to be caused by the pump but may not necessarily be a fault. I run an in-tank pump from SNG and that runs constantly with the ignition on. Your SU may cut in and out depending on load. A regulator is typically only useful if a non-standard higher pressure pump is fitted and works by capping the pressure and returning the excess to the tank. The SU pump already has that cap enabled by design. The pump spec is chosen to shift enough volume of fuel at redline rpm and do so at a pressure sufficient to overcome the spring/jet holding the float bowls full of fuel and no more. As an experiment, you could up the pressure setting and see how strong the pump actually is. If you have a failure to close the float bowl at the carburettor, then all that will happen will be that fuel pours out at 2.5psi instead of 3psi (or whatever the SU pump normally delivers). If you are accelerating hard or running at redline rpm, you probably want those float bowls refilled as fast as the carburettor allows, rather than at a lower cap, to avoid any potential lean condition under heavy load. 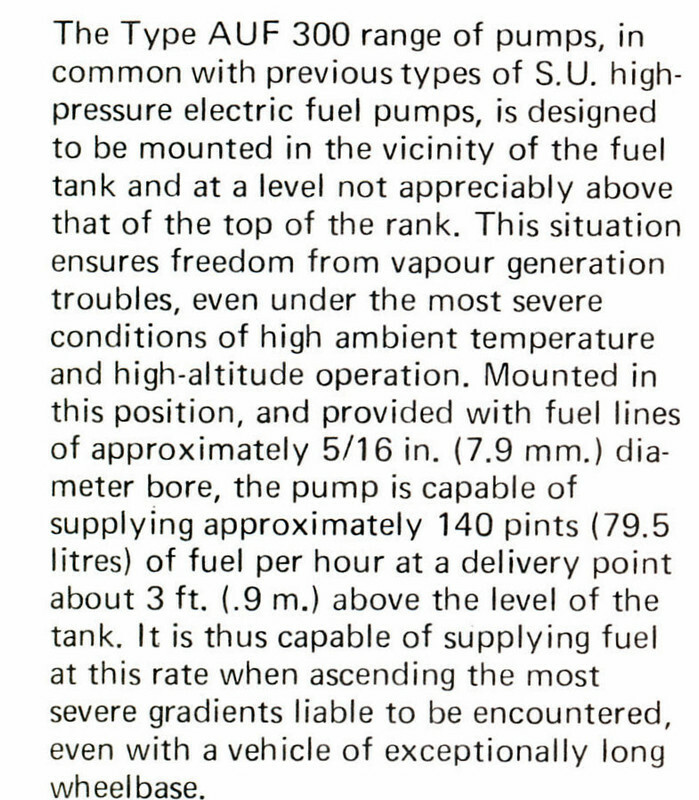 Perhaps I should have used the phrase "may return fuel to the tank", as a regulator designed for use with a low pressure lift pump such as the SU doesn't need a return, whereas one used with a high pressure, high volume pump for fuel injection, will. The word "cap" doesn't imply that that pressure is seen 100% of the time and at no point in my post have I remotely implied that the pressure is held constant at that cap. All I have said is that having a regulator almost certainly serves no purpose as the oem hardware has already been chosen accordingly. By contrast, the regulator may serve a purpose if a non-standard higher pressure pump is fitted. In this case, it'd want to ensure that the line pressure is not so high that the already full float bowls are overfilled which can happen when pump pressure exceeds atmospheric pressure. Pumps used for fuel injection typically run at three times atmospheric pressure. I have an SU pump and a Malpassi regulator on 2 cars, which I have set at about 2.5. Incidentally last week I controlled the pressure on both with engine running at idle and raising revs to 3000rpm: pressure never drops to 0 even if you let engine on idle for few minutes. Furthermore pressure is retained when engine is shut, but did not test for how long. I do this test every spring to check for any change in running pressure. I'm getting more confused . Is fitting a Filter King to a car with the standard SU pump worth doing or not? Previous posts, including from illustrious people, seem to recommend them, but is that only if you've got a none standard pump and/or none standard air filter and carb needles?